I have a Record DML 24X lathe that has been previously upgraded with the swivel head and the four speed pulley conversions. 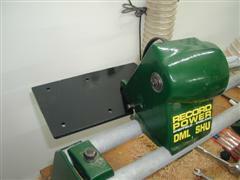 I found the four speed conversion a limitation and wanted a variable speed lathe. I don’t turn very large items and I have a considerable investment in accessories for this lathe (chucks, drives, tool rests etc) and so felt that it was better to upgrade to variable speed rather than replace it. This is a description of how I performed the upgrade. PLEASE NOTE THAT IF YOU FOLLOW WHAT I DID IT IS AT YOUR OWN RISK. YOU ARE DEALING WITH LETHAL VOLTAGES AND SO IF YOU ARE UNSURE OF WHAT YOU ARE DOING DON’T DO IT. I CAN IN NO WAY BE HELD RESPONSIBLE FOR ANY INJURIES OR DAMAGES THAT YOU OR YOUR EQUIPMENT SUFFER. The first job was to remove the motor from the head stock. I then marked the underside of the headstock with an indelible marker to show how it moved when the head swivelled. This allowed me to make the necessary measurements for the new mounting plate for the new motor. The next job was to construct a new mounting for the motor. This I fabricated from 6mm steel plate that had a cut out to allow the head to continue to swivel and another piece welded on one side to allow it to make a more secure fixing to the headstock. If using a more powerful motor thicker steel plate would probably be required but ensure that the head still swivels. The clearance between the plate and the bed bars is quite tight. 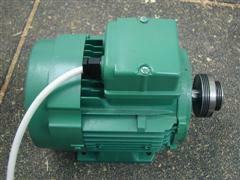 This is the three phase motor that I used it is rated at 550w or 3/4 HP. 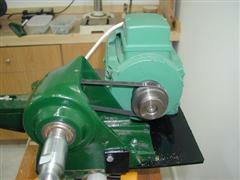 The pulley is the old 3 speed one for the output shaft of the lathe with the larger wheel turned off. The output shaft of the new motor was 19mm which was the same as the old output shaft. 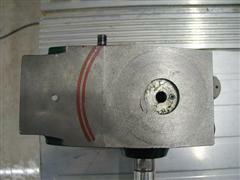 The old input shaft pulley was 62mm in diameter. The new one is 1 mm bigger and so the lathe runs slightly faster 50 revs. 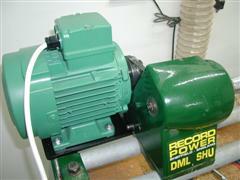 With the output of the motor being 1450 rpm the maximum output speed is now 2125rpm. This means with the inverter putting out the voltage at 100hz I now have the ability to turn at 4250rpm with peak power being delivered at 2125 rpm. This photo shows the new motor plate mounted on the headstock and the headstock back on the lathe. The plate is simply bolted onto the headstock. The headstock is made from cast iron so sharp drills are essential. I only used two bolts for the plate because that was all I had room for ideally I would have liked more but it does seem to be strong enough so far. These two photos show the motor mounted on the lathe and the drive belt is tensioned by the adjustable mounting slots in the motor mounting plate. These photos are taken without the belt guard in place. The belt guard had to have the hole in the side for the input shaft enlarged as the new motor is mounted in a different position and in a different way. This photo shows the installation complete. On the wall in the metal cabinet is the single to three phase converter. Just behind the motor is the motor controls which are shown slightly larger in the photos below. 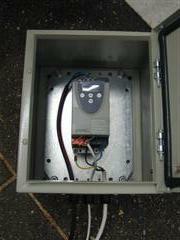 This photo shows the inside of the mounting box for the 3 phase converter. 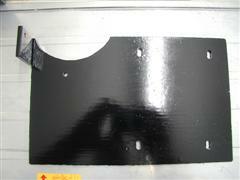 It is mounted on a substantial steel plate for a heat sink. The specific details about this will be unique to the individual converter that you use. Please remember there are dangerous voltages in the cabinet and follow all the warnings and advice that come with your converter. This photo shows the simple plastic housing with the start and stop push buttons and the variable resistor for the actual speed control. The controls work at 12 volts so there are no dangerous voltages within this housing. 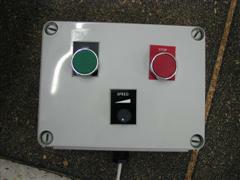 Ensure that you have the manual for your converter as this is what contains all the wiring information. My converter required a three core cable as the single phase input, four core cable for the output plus six core (ideally screened) for the stop/start and speed control. I re-programmed the converter (detailed in the manual) for momentary action start and stop buttons rather than latching buttons (that is personal choice). The converter is continually powered as Spanish outlets are not switched. I will be buying a suitable power switch and fitting it to the converter cabinet so that I can turn it off without unplugging in the next few days. So was it worth it yes most definitely. 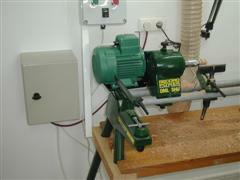 It was easy for me to do and it gave me the flexibility that I needed for my turning. The 3 phase converter I got for £40 brand new from eBay www.ebay.co.uk. A new converter from a retail supply outlet is ~£150 so this is what made this upgrade feasible, converters are regular items on the UK eBay website. The motor I got from a local motor rewind firm that I found in the Yellow Pages and it cost £60. The cable housings and controls came from a friend who got them from Radio Spares but they should be available from any decent electronics supply house such as Maplins, CPC etc. All in all it cost me about £140 and took about 6 hours to make, this six hours was spread over two weeks due to other commitments. 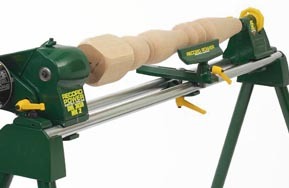 These instructions should be fairly generic and allow you to do this upgrade to any wood lathe without variable speed.